Personal Touch Professional Cleaning Service incorporates OSHA principals, chemical and equipment training, and certified Ariel lift personnel to assure top quality, time-effective cleaning methods. We offer a wide range of construction and commercial cleaning services developed around your goals, schedule, and budget. State and federal laws, as well as company policy, make the safety and health of our employees the first consideration in operating our business. Safety and health in our business must be a part of every operation, and every employee’s responsibility at all levels. It is the intent of Personal Touch Professional Cleaning to comply with all laws concerning the operation of the business and the health and safety of our employees and the public. To do this, we must constantly be aware of conditions in all work areas that can produce or lead to injuries. 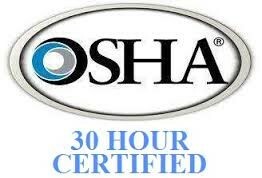 For this reason our employees are safety trained and certified. Personal Touch Professional Cleaning Service is willing to go the extra mile to make an excellent first impression for your customer! We understand that first impressions. We at Personal Touch are the Director of First Impressions. We endeavor to true up a scope that meets your company as well as the owners specifications and to perform these tasks up to a standard of excellence leave little or no punch list items to complete. We ask our clients to Rest Assured that the cleaning will be done correctly the first time and pride ourselves in our experience in doing so. Personal Touch constantly adds measures to assure the products available and equipment we use are friendly to our environment. We take every measure to prevent cross contamination by using systems designed to avoid these risks. Our state of the art dust removal systems effectively traps dust, pollen, dust mites and other contaminants responsible for allergies and asthma. For everyday all purpose cleaning Personal Touch utilizes Green seal approved hypo allergenic cleaning solutions. We do realize that tough to clean areas such as surfaces with mildew or stains may require more aggressive cleaning chemicals which we also have available. By scheduling a cleaning on a regular basis, the need to use strong chemicals should decrease over time. Serving Central, PA and the surrounding areas with professional cleaning services, Personal Touch Professional Cleaning Service can create a custom cleaning scope that meets the requirements for your project as well as your budget. "Shariah Brown launched Personal Touch Cleaning Service 11 years ago with two people and a ..."